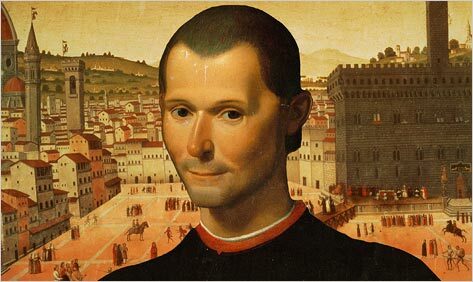 I have copied here the bulk of Machiavelli’s legendary letter to Francesco Vettori. Ever since the first time I encountered this piece, it has enchanted me; for there is a certain honesty in this method which, I believe, is probably more closely aligned with the reality of study than most (myself included) would like to admit. The sheer juxtaposition of two ways of life, barbarous and civilized, would by many modes of thought appear to be either an irresolvable paradox or a superfluous load of fluff, distracting from true scholarship. But a little thought reaffirms that at the very least two lamps, reason and experience, though at times contradictory, are in fact complementary to each other and thereby codependent, symbiotic. They must be kept in balance. Other lamps may play their parts, but by observing the ways of man both through bookery and the living of life, the scholar frees himself from those great flaws of the acolytes of reason and of evidence- the one, that snobbish belief that one might know all things by the exercise of one’s own mind, the other, that self-righteous insistence that only the things that have happened can be known. But though the first two paragraphs here listed are critical, I have placed the third in bold intentionally- for it is this gem of literature which I believe encapsulates how the Study of Man ought to be conducted, when it is conducted by books. While evidence gleaned from the annals and artifacts of old is indeed critical for the understanding of events, nothing quite strikes the chord of connection to oneself like the words of the men of old. And one cannot befriend figures and maps the way they can dead, historic individuals, through their words. On another note, I particularly appreciate this passage in the fact that it is, in my opinion, the greatest refutation of the ‘Satire’ argument about The Prince. There are those who argue that The Prince was not a serious work, that Machiavelli wrote it to mock the Medicis and show to them an excessively inaccurate and brutal caricature of political life. While certainly context and purpose are central, critical to any work, particularly one so far removed from our own time as a masterpiece like The Prince, the Deconstructionists who argue that ‘Machiavelli did not mean what he said’ do nothing more than obfuscate the record of facts and cast forth a hopelessly inaccurate (and, in my opinion, truly immoral) picture of human nature. When I leave the wood, I go to a spring, and from there to an aviary of mine. I have a book under my arm, Dante or Petrarch, or one of the minor poets like Tibullus, Ovid, and such. I read of their amorous passions and their loves; I remember my own and enjoy myself for a while in this thinking. Then I move on along the road to the inn; I speak with those passing by; I ask them news of their places; I learn various things; and I note the various tastes and different fancies of men. In the meantime comes the hour to dine, when I eat with my company what food this poor villa and tiny patrimony allow. Having eaten, I return to the inn; there is the host, ordinarily a butcher, a miller, two bakers. With them I become a rascal for the whole day, playing at cricca and tric-trac, from which arise a thousand quarrels and countless abuses with insulting words, and most times we are fighting over a penny and yet we can be heard shouting from San Casciano. Thus involved with these vermin I scrape the mold off my brain and I satisfy the malignity of this fate of mine, as I am content to be trampled on this path so as to see if she will be ashamed of it. When evening has come, I return to my house and go into my study. At the door I take off my clothes of the day, covered with mud and mire, and I put on my regal and courtly garments; and decently reclothed, I enter the ancient courts of ancient men, where, received by them lovingly, I feed on the food that alone is mine and that I was born for. There I am not ashamed to speak with them and to ask them the reason for their actions; and they in their humanity reply to me. And for the space of four hours I feel no boredom, I forget every pain, I do not fear poverty, death does not frighten me. I deliver myself entirely to them. And because Dante says that to have understood without retaining does not make knowledge, I have noted what capital I have made from their conversation and have composed a little work, ‘On Principalities’ (The Prince) where I delve as deeply as I can into reflections on this subject, debating what a principality is, of what kinds they are, how they are acquired, how they are maintained, why they are lost. And if you have ever been pleased by any of my whimsies, this one should not displease you; and to a prince, and especially a new prince, it should be welcome….